Jim Dandy advertising in "The Colonnade"
I have been into the story of the small Jim Dandy record label since late 2010. Since my first post about it back then, I was able to assamble more detailed information about this local South Carolina label that was operated by Jim Price. Carolina music researcher Vance Pollock as well as a handful of witnesses and relatives of Price made it possible to present now an extended write-up about it. 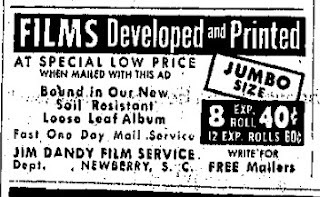 The Jim Dandy record label originated from the small Jim Dandy recording studio, which was located in the Jim Dandy Film Service in Newberry, South Carolina. The film service was opened by James Broy "Jim" Price (born in 1918) and his wife Rita in 1957. By the late 1950s, Price also built a small recording studio within the film service and in 1961, set up the Jim Dandy record label. Its first release was the Elvis inspired "Destiny and Desire" / "Please Be Fair" by Fred Thompson that same year. 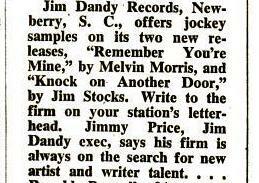 In December 1961, Billboard reported that Jim Dandy "offers jockey samples on its two new releases," which were by Melvin Morris with "Charlie's Got a Horn" / "Remember You're Mine" (Jim Dandy #1004) and Jim Stocks with "Knock on Another Door" / "Shadows" (Jim Dandy #1005). Further, Billboard explained that Price was always looking for new artists and songwriters. Most of the releases were by local artists, including Eddie Kirkley and the duo Buck & Tommy. Songwriter Bill Trader, well-known for penning the hit "(Now and Then) There's a Fool Such As I", recorded an album of his own compositions on Jim Dandy. Trader was born on May 1, 1922, and hit big in 1952 with "(Now and Then) There's a Fool Such As I." It became a hit when Hank Snow recorded it and was later successfully covered by Elvis Presley, Jo Stafford, and Petula Clark. In 1962, Trader and his band, the Castaways, recorded an album of his own compositions. The songs "Cherokee Call" and "Bitter Harvest" from that album were also released on 45rmp. Another act that recorded for Price was the duo Buck Jones and Tommy Hagen. They were from Wilson, North Carolina, and performed locally with Jimmy Capps, specializing in Louvin Brothers songs. In 1960, they had recorded their first disc for Ronald Killette's Glendale label and followed up with "A Lost Love" / "Never Love Again" for Price's Jim Dandy label (Jim Dandy #1007). The songs were in the Louvin style, which is no suprise since their lead guitarist Jimmy Capps was playing with the Louvins since 1959. Another disc by Buck and Tommy was rushed out by Price in 1962, comprising "Forever" and "Where Shattered Memories Are" (Jim Dandy #1008). Hagen joined up with Charlie Louvin about eight months after the Louvin Brothers split up in 1963. He played mandolin and sang the high harmony parts that Ira used to provide. Buck Jones remained in the Wilson area, recording some more 45s for Tiki Records, working on radio and television as well as running his own nightclub that closed in 2015. 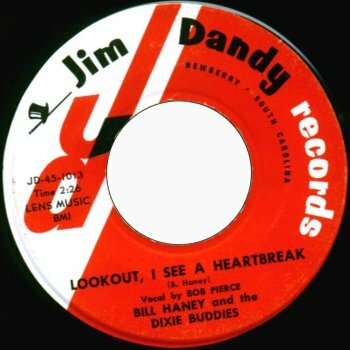 In 1962, Bill Haney and the Dixie Buddies had at least two releases on Jim Dandy. While "Oh! How I Cry" (Jim Dandy JD-1012) was a bluegrass song, his version of the "Crawdad Song" on Jim Dandy JD-1013 is a country outing with rock'n'roll elements. Haney was born in Haywood County, North Carolina and in 1957, he was part of Curtis Lee and the Dixie Buddies, with whom he appeared on the WRVA New Dominion Barn Dance out of Richmond, Virginia. His first record was made for the Atlanta based Super label. He toured the east coast in the 1950s and 1960s, playing country, bluegrass, and rock'n'roll, and also recorded for Dee-Dee and JFI. In the 1980s, he performed locally with a band called the "Zassoff Boys" and also recorded an album with this group. Jim Price closed down his Jim Dandy business in the early 1960s. In 1968, his wife Rita died but he remarried in 1971 and moved to Clinton, South Carolina, where Jim Price died in 1989. He was buried at the Newberry Memorial Gardens next to his first wife. Note: The number JD-1002 was apparently used twice. Thanks Bob! Your additions are always great! I doubt if the Jim Dandy Castaways are the same as the Soma Castaways. They were upper midwest natives who were in thier teens in 1965 and it's doubtful they would have recorded on an obscure Carolina label in about 1962. Re; The kiddie record by Ray Heatherton is probably the same Ray Heatherton who was the "Merry Mailman" on NY City kid TV in the early-mid 50's. He made a number of kiddie records thru the years. He was also the father of singer/dancer/bombshell Joey Heatherton. 1006 - Jim Hardin "It's A Shame" / " Blue Eyes"
1015 - The Ideals Combo "Lift-Off" / "Double Shot"
They are Buck Jones and Tommy Hagen from Wilson, N.C. Tommy Hagen joined up with Charlie Louvin for about 8 months after the Louvin Brothers split up in 1963 to play mandolin and sing the high harmony parts that Ira used to provide. Buck Jones remained in the Wilson area recording some more 45s for small local labels and working in radio, television and the nightclub business. I have the Castaways - Caravan 7" and i have always wondered what the other records on this label sound like. Any tips on the best way to track any of the other ones down? one possibility would be ebay and buy the records. I have also two Bill Haney recordings and Howdy over at his 45 blog has the Saxons 45 posted, just search the blog. The Castaways on the Jim Dandy label were Bill Trader and the Castaways - Bill Trader who penned the hit "Now And Then There's A Fool Such As I" (recorded by Hank Snow, Elvis and others). The small studio was located inside the Jim Dandy photo finishing /film developing shop in Newberry in the late fifties and early sixties and was operated by Jim Price. Do you have more info on the label/studio, e.g. how long it lasted? James Broy "Jim" Price married my great-grandmother Ruth in 1971 and moved to Clinton, SC. He died in 1989 and was buried in Newberry Memorial Gardens next to his first wife Rita, who died in 1968. Jim Dandy pressed a few of his records with Kay Bank in Minneapolis. I have label scans of at least 8 releases, if you want them just email me.